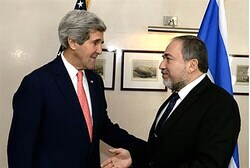 Kerry and Israel’s foreign minister, Avigdor Liberman. A two-state solution will be clearly underscored as the only real alternative. Because a unitary state winds up either being an apartheid state with second-class citizens — or it ends up being a state that destroys the capacity of Israel to be a Jewish state. If this sounds familiar to you, you are right. In 2010, then-Israeli Defense Minister (and former Prime Minister) Ehud Barak said that if Israel does not achieve a peace deal with the Palestinians, Israel will become either a binational state or an apartheid state. Barak is the most decorated soldier in Israel’s history. Tzipi Livni and Ehud Olmert are among the other Israeli leaders who have used the term “apartheid” similarly. After Ehud Barak made his remarks in 2010, did the Zionist Organization of America and the Emergency Committee for Israel call on him to resign? Did Protect Our Heritage PAC urge its members to flood the Israeli embassy with protest calls? Did other organizations send stand-alone emails condemning his remarks? None of that happened. But it did happen the day after Kerry’s remarks were reported, before he even had a chance to respond. Kerry did not say Israel was an apartheid state. He said that if it does not reach a two-state solution, an apartheid state is one possible outcome. Israeli Arabs — 20 percent of Israel’s population — vote, have political parties and representatives in the Knesset and occupy positions of acclaim, including on its Supreme Court. Arab patients lie alongside Jewish patients in Israeli hospitals, receiving identical treatment. Barak, Olmert, Livni, and Kerry were wrong to use the term not because they said Israel was an apartheid state — it is clearly not and they clearly did not — but because the term is so charged, loaded, and capable of misinterpretation. Using that term was a mistake. But the over-reaction was also a mistake. If Kerry had really said Israel was an apartheid state, then the reaction would have been appropriate. But he did not, and it is clear even from the Daily Beast report what he meant. The correct response, from a pro-Israel advocacy standpoint, would have been to tone down the response, lay off the panic button, and remember that Kerry has been a strong friend of Israel throughout his decades-long career. We have enough real enemies without creating for ourselves imagined ones. Unfortunately, some of our right-wing friends just could not resist this “gotcha” moment. This forced centrist and even center-left organizations to join in, lest they be accused by the right or by certain of their donors of being soft on the apartheid accusation. The result is that we have got the world entertaining the absurd notion that the U.S. Secretary of State might think that Israel is an apartheid state. Even the best public relations firm could not have given the Palestinians a better earned media bonanza. Nice job, guys. For more than thirty years in the United States Senate, I didn’t just speak words in support of Israel, I walked the walk when it came time to vote and when it came time to fight. As Secretary of State, I have spent countless hours working with Prime Minister Netanyahu and Justice Minister Livni because I believe in the kind of future that Israel not only wants, but Israel deserves. I want to see a two state solution that results in a secure Jewish state and a prosperous Palestinian state, and I’ve actually worked for it. I will not allow my commitment to Israel to be questioned by anyone, particularly for partisan, political purposes, so I want to be crystal clear about what I believe and what I don’t believe. Second, I have been around long enough to also know the power of words to create a misimpression, even when unintentional, and if I could rewind the tape, I would have chosen a different word to describe my firm belief that the only way in the long term to have a Jewish state and two nations and two peoples living side by side in peace and security is through a two state solution. In the long term, a unitary, binational state cannot be the democratic Jewish state that Israel deserves or the prosperous state with full rights that the Palestinian people deserve. That’s what I said, and it’s also what Prime Minister Netanyahu has said. While Justice Minister Livni, former Prime Ministers Barak and Ohlmert have all invoked the specter of apartheid to underscore the dangers of a unitary state for the future, it is a word best left out of the debate here at home. At least some organizations might have acted differently if they had just waited 24 hours. While we may disagree from time to time, we have never doubted Secretary Kerry’s commitment to Israel’s security and his good faith efforts to find a fair, equitable and lasting solution to the Israeli-Palestinian conflict. He is a true friend of Israel. His statement makes that clear, and we consider this chapter closed. The problem is not inside Israel; the problem is on the West Bank. The settlers who entangle Israel in the lives of Palestinians believe that they are the vanguard of Zionism. In fact, they are the vanguard of binationalism. Their myopia will lead to the end of Israel as a democracy and as a haven for the Jewish people. The regime they help impose on Palestinians is cruel, unfair and unnecessary. Rather than label this regime in an incendiary fashion, I now prefer simply to describe its disagreeable qualities. But if Kerry, following Barak’s lead, wants to warn about a possible apartheid future for Israel, I’m not going to condemn him as anti-Israel. Israeli leaders must open their minds to the possibility that he has their long-term interests at heart. That’s just politics, you (or Macbeth) might say — “a tale told by an idiot, full of sound and fury, signifying nothing.” To some extent, I would agree. But if there’s ever going to be an end to this wretched problem, somebody — and it’s almost certainly going to have be an American President or Secretary of State — is going to have to rise above politics and bring the two sides together. What just happened to John Kerry demonstrated why that’s getting even harder to do. The goal of pro-Israel advocacy is to bring the U.S. and Israel closer, not to create divisions for partisan gain. That is why so many pro-Israel members of Congress from both parties wisely refrained from public comment. Following Kerry’s statement and the statement of support for Kerry from Israel, there is really not much more that can or should be said. Before Toddlers With Tiaras and Dance Moms… There Was Rose! reviewers) in a way that we have never seen Rose portrayed. Tovah’s take on the iconic role took the character from the highs and lows living her life vicariously through her daughter’s careers and wrapped them up in a truly unique package of when her character needed to take action, the fire in her eyes and the raving richness of her bellowing voice showed that she was a force to be reckoned with. Tovah’s Rose never shuts down, as we can see she is always simmering even when she is in the background. We have seen many a Rose take us on the journey, but this would be the first time we felt the driving force pushing us into the story as she pushed her daughters into theirs. Mazal Tov to you, Tovah for this truly rare look into Rose’s life. audience believe he was creating the movement on the spot. Speaking of Kathryn Kendall, who put her talents into overdrive as the show’s choreographer as well as portraying Miss Cratchitt and the ever so subtle Mazeppa, showcased herself as a true seasoned professional who has the entire package! Watch out for Bethe B. Austin who knocks the Tessie Tura character out of the ball park with a grand slam performance. This production is a “must see”. And if you have never been to visit the Bristol Riverside Theatre, you must visit to take in its charm as a delightful performance space. The friendliness of the box office staff, the ushers and everyone involved in the evening truly made you feel appreciated for coming out to support their efforts. Upcoming productions included in their 25th Anniversary season include a new play, A Raw Space by Jon Marans, the laughter through tears masterpiece Steel Magnolias by Robert Harling, and finishing out the season Jonathan Larson’s Tony and Pulitzer Prize winning musical Rent. Gypsy is presented by Bristol Riverside Theatre, 120 Radcliffe St., Bristol, PA now through Jan. 15th. Tickets: $40-$65. Information: 215-785-0100 or www.brtstage.org<?a>.